An example of what to wear in Hawaii. If it is your first time, you might not know what to wear in Hawaii. The weather in Hawaii is tropical and mild. Temperatures range from 78 to 88 degrees Fahrenheit during the day and 65 to 75 degrees Fahrenheit at night. As you might expect, there is no need for true cold weather clothing in Hawaii. However, there are still some recommendations which can be helpful for new travelers. Hawaii’s climate is generally more consistent throughout the year than on the mainland US. Its weather is heavily influenced by the northeasterly trade winds or the lack thereof. The trade winds bring mild and cooler weather. Fortunately, trade winds blow 70% of the time in Hawaii. However, if the winds are coming from the southwest, they are referred to as Kona weather. In such instances, the weather will be hotter and more humid. Plus, the Kona weather winds are often accompanied by vog. Vog is smog associated with the volcanic eruption on the Big Island which has been continually ongoing since 1983. The vog makes the hotter more humid Kona weather even more unpleasant. Unfortunately, this is especially for those with respiratory problems. Fortunately, for the most part, Kona weather typically doesn’t last beyond a day or two. Understanding these conditions, you should try to dress as comfortably as possible when traveling to the Aloha State. We suggest wearing clothes made out of cotton fabric or even those made out of those breathable synthetic materials. While it rains throughout the year, the wettest season is typically during the winter months. Temperatures will not be very cold. So your best bet in protecting yourself from Hawaii’s often rainy weather is to use an umbrella. Invest in one of those small collapsible types that you can easily pack in your suitcase. Or you can buy one at a convenience store when you arrive in Hawaii. Do you feel cold in temperatures ranging from the high 60s to low 70s degrees Fahrenheit? If no, there might be no need for you to bring a jacket or sweater. Maybe you might need it on the long plane flight, which at minimum would be 5 hours long. But for the most part you won’t need it on the ground. However, if you feel you need one, a light jacket or sweater should suffice. There is only one exception to this. If you plan to spend a lot of time at higher elevations beyond 10,000 feet you may need a heavy jacket. You can find conditions like these at Haleakala National Park on Maui or on the summits of Mauna Kea or Mauna Loa on the Big Island of Hawaii. Here, temperatures can be near or below freezing during winters. The second factor regarding what to wear during your travel to Hawaii is that most people in the Aloha State dress much more informally than in other parts of the country. If they are not working, many male residents simply wear shorts, t-shirts or polo shirts with slippers. Note that locals do not call slippers “flip-flops” as people on the mainland do. Many female residents also wear shorts, cotton wear tops and casual footwear. If you prefer wearing some sort of covered footwear, you can certainly get by with wearing some sort of sneakers. You generally won’t go wrong dressing casually like this. And it would be an acceptable form of dress to most anywhere in the State. The only exception would be in a business setting or if you are planning to go to a somewhat more formal affair. Of course, if you plan to do some hiking or trekking in the mountains, it would require attire and footwear appropriate for such activities. Thinking about what to wear in Hawaii for business or for more formal event or restaurants? If so, some casual slacks along with a collared shirt and casual shoes (but not sneakers) would be more than appropriate. 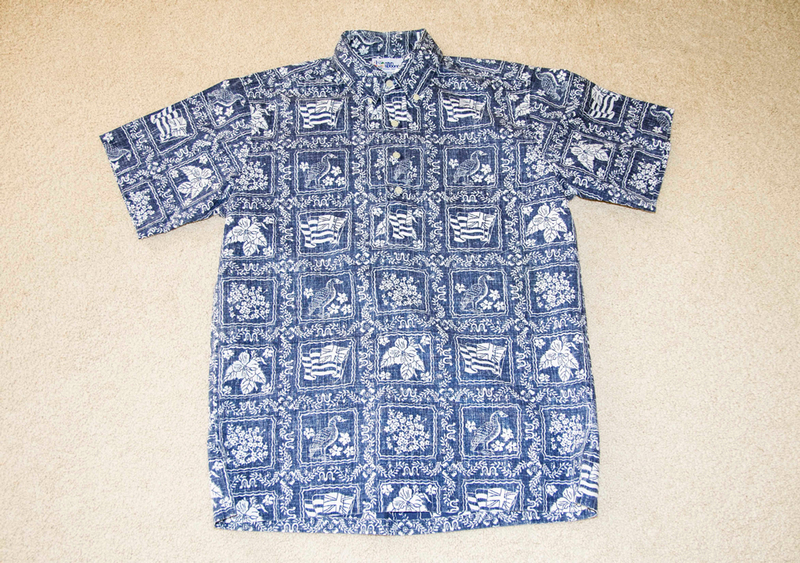 Note those colorfully printed shirts with Hawaii themed designs are properly called aloha shirts in Hawaii. Absolutely no one in Hawaii calls them “Hawaiian shirts.” Women can wear attire in the form of an everyday dress, blouse and skirt ensemble or even a mu’umu’u. However for the most part, most women in Hawaii do not wear mu’umu’us anymore. Wearing clothes like these is often referred to in Hawaii as “aloha attire.” And it would most probably be the most formal type of dress you would have to wear in the Aloha State. To sum it all up, if you’re planning to go to Hawaii, dress casually for nice and warm weather.